Casa Indigo is Located in the Nosara Verde homes on Calle de los Mangos here in Playa Guiones. This 3 bedroom 2 bath home is perfect for your retreat vacation here in Costa Rica. On the first level, you will find a master suite with a king bed and large bathroom picture windows near the roof line providing good ambient light and views. The Gourmet Kitchen includes a 5 burner, stainless steel gas stove with deluxe side by side stainless steel fridge. The kitchen ceiling is adorned with recessed bamboo making for a beautiful tropical feeling. A large, Granite island in the middle of the kitchen and a wood bar off to the side to create a casual dining atmosphere. The living area is dressed with two large sofas, custom teak tables, large mirror, surf rack and custom artwork. Great place to chill, chat and make plans for the day. Bedrooms 2 & 3 are located up the stairs adorned with shells, sea glass and bright windows. Both include ample storage, one double bed and one twin bed which can double as a comfy day bed. Bedroom #3 has a private outdoor patio. Just outside the entrance you will find a sweet space to relax & Take it all in. 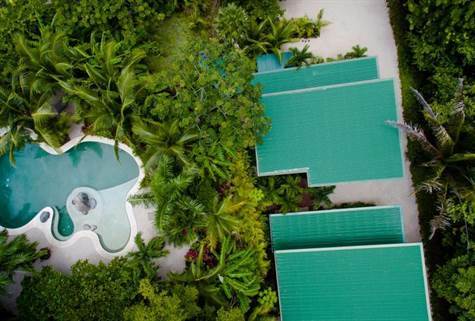 Each home includes a private outdoor shower and access to the large saltwater pool with waterfall and Jetted area. Casa Indigo is a 1,850 ft.2 new home built here in Playa Guiones and has been functioning as a vacation rental.